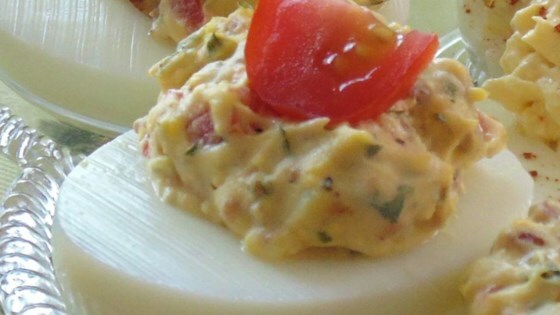 "Bacon, tomatoes, and parsley add just a little twist to regular deviled eggs." Cut eggs in half lengthwise; place egg yolks in a bowl. Mash yolks with a fork; stir in crumbled bacon, mayonnaise, tomatoes, and parsley. Season with salt and pepper. Arrange egg white halves on a serving platter; spoon yolk mixture into egg whites. Refrigerate, covered, until ready to serve. Make extra bacon, crumble, and sprinkle over eggs to garnish, if desired. Not bad deviled eggs. If I made them again, I wouldn't add any salt because that is part of what the bacon adds. These are great. Didn't change a thing and will make again. They were easy to make, awesome to eat and had all of the ingredients I love!!! This reciepe made me the talk of the party. Everyone enjoyed the spin on the Deviled Eggs. Made exactly as recipe states. Lots of compliments all around. Tasted great and was a hit!